Attended ILUGC's monthly meetup yesterday.I'm attending the monthly meet after a really long time.One of the reason's why I wanted to attend was because my involvement with the Chennai LUG community had been diminished and wanted to re-establish it.It was good to see the lot's of new faces at the Meet.Raman, the regular was there as usual.Missing in action were Bharathi. 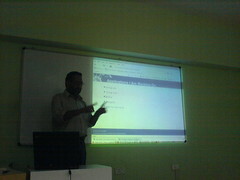 Anyway another reason ws Kenneth Gonsalves a.k.a who had come down to Chennai from Ooty, and I had been pestering him for the last two months to give a talk at ILUGC.Anyway, he finally came and I really wanted to meet him in person,I've only met corresponded to him on IRC. 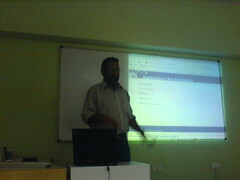 He was here to talk to the ILUGC about the contribution of India to FOSS.He also mentioned on how important scripting languages and esp. Python is to the FOSS Indian community and what is really required is end-user applications which can be used by the common Indian man. Talk went well and we ended up talking up on the state of FOSS in India and on avsap, his pet project on Accounting and a serious competetior to Tally in the Indian Accounts Software Space in India. The other presentation of the day was from a representative of OpenLX on KalCulate,another Accounting package running on Linux but non-free.I was also (forced to take away? ;)given a OpenLX Distro CD. heh,PSP anyday. I have a 2GB card on the PSP for games and movies. A 1Gb card in my phone for the music. I am not an open source supporter or anything, but I've attended one ilug meet, the one which Richard Stallman debuted. But it was a geeky gang there. PSP is the all round winner. cool to know you have participated in meets before.Are you on the ILUGC mailing list ? IIRC, RMS had two talks,one at MIT and the other at IIT. I was on the list, but never participated. Don't use linux much but have participated in open source software development. I attended the one in MIT.